Product #2847 | SKU AG-BS300E | 0.0 (no ratings yet) Thanks for your rating! The AG-BS300 base station connects with the AG-CA300G camera adapter with two BNC cables allowing transmission of HD digital images, return images, tally signals, mic signals and genlock signals. The base station also comes with a power cable that runs along the BNC cables to supply remote power to the camcorders. 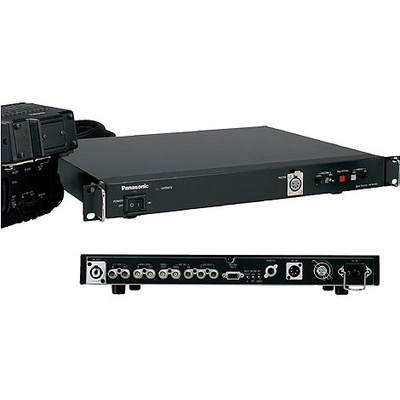 The base station features two HD/SD SDI outputs and a composite video output. Cables for the base station are available in two lengths: 328 feet (100M) and 164feet (50M). Users can remotely shade or paint the camcorder from the control room.